Radon, specifically radon isotope-222, is a colorless, odorless, tasteless radioactive gas that is produced as a natural decay product of uranium. Uranium and radon occur in varying amounts in all rocks and soils, and radon gradually seeps from the Earth into the atmosphere and may find its way into buildings. Radon, can build up indoors, especially in lower levels of the home. The U.S. Environmental Protection Agency (EPA) recommends that the lowest living area (basement or ground floor) of all homes and other buildings with frequent human occupation should be tested for radon. Radon is present in outdoor air as well, but the concentrations outdoors are usually substantially less than those found indoors. According to EPA, radon-222 is responsible for up to 20,000 lung cancer deaths per year in the United States. EPA recommends that remedial action be taken if radon concentration exceeds 4 picocuries of radon per liter of air (4 pCi/L). Studies indicate that radon will cause between one and five lung cancer deaths per 100 people living for 70 years in homes with this concentration. The radon concentration of outside air is generally less than 0.5 pCi/L. In 1990, NBMG in conjunction with the Nevada Division of Health and the EPA, conducted a year long survey of radon in the indoor air of homes in Nevada. The results from over 2,000 measurements were compiled and published NBMG Bulletin 108, Radon in Nevada, which is available from the NBMG Publication Sales Office. 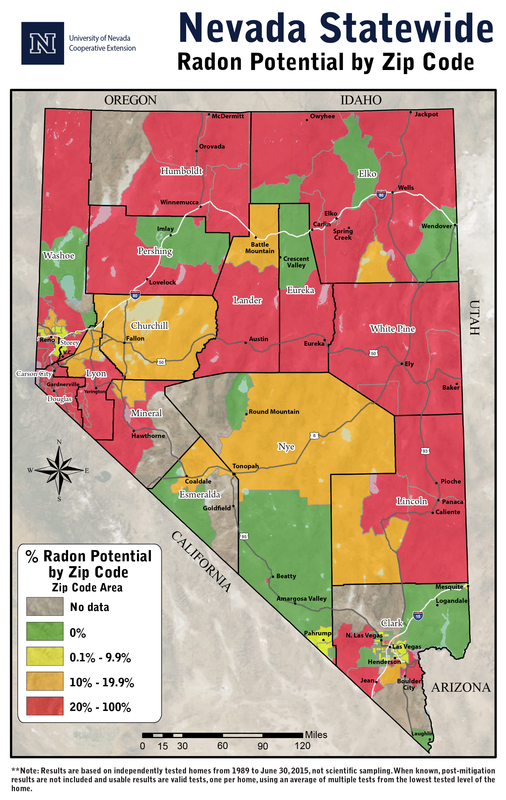 Bulletin 108 contains an Indoor Radon Potential Hazard Map of Nevada, discusses the measurement procedures and how the survey was done, shows the results of different towns and cities, and shows what can be done to mitigate problems. NBMG Educational Series No. 18, Radon in Nevada - a Natural Hazard, is a condensed version of NBMG Bulletin 108 as a free brochure also available from the NBMG Publication Sales Office. Refer to these NBMG publications about radon: SP17, B108, OF1995, E18, and E21. MyHAZARDS-Nevada - Interactive hazard map for the state of Nevada. Click on the radiation symbol and select radon potential and radon average. Also, the USGS and the EPA both have a number of publications dealing with radon.